duh… so these risky things, because people welch on rent a bit dont they… they will be junk rated yes? But at least we have learned from the CMO debacles yes? yes..? The structure of the deal would be similar to better-known securities, such as those backed by home or commercial mortgages. This entry was posted in Blogpost and tagged CRAPS, economy, securitization on July 31, 2013 by brianmlucey. Strategic Mortgage Default: What does the research tell us? What do we know about strategic (could meet obligations but choose not to ) defaulters in relation to mortgages? As few as 15% of US defaults might be strategic (Gerardi et al. 2013) . Or it might be higher (but the methodology (Guiso, Sapienza, and Zingales 2011) used is to ask people, in effect, if they know someone who they think could have repaid but didn’t…) at around 25%. If its not 1/3 or more in the USA with more liberal bankruptcy and recourse laws then is it credible that it is 1/3 here? People feel regret but not shame when they default (M J Seiler et al. 2012). There is a massive ‘fear factor’ on which lenders play, as well as asymmetrical fears of moral hazard (White 2010c). Default is not just an individual but also a social phenomena and there can be “herding” in defaults (M J Seiler, Lane, and Harrison 2012). This is perhaps an under researched area. The more you repossess the less a stigma it is and the more likely people are to strategically default (Wilkinson-Ryan 2011). The law of unintended consequences therefore suggests that if we move to a significantly more aggressive repossession culture we will see cascades of defaults with the consequent knocking back of property prices and erosion of bank balance sheets…. be careful for what you wish. Less information about the process is useful from the perspective of the lender in reducing the incidence of default (M J Seiler 2013). Theres no doubt that the Irish system is opaque, and perhaps deliberatly so. There’s a contract between the lender and the borrower but even in law there can be a ranking of contracts and the social/familial contract supersedes this other contract allowing for default. (White 2010b). Many defaults precipitate not from rational but from emotional decisions, thus reducing the emotional crises points can and does reduce default (White 2010a). Most people want a fair deal, which allows them to continue servicing debts at a reasonable rate but with certainty about where the future lies. Oh, and some people might be neurologically more inclined to default than others…( Seiler, Walden, and Lane 2012). Might we see MRI scans as well as payslips being required in future before mortgages are approved? Bhutta, Neil, Jane K. Dokko, and Hui Shan. 2011. “Consumer Ruthlessness and Mortgage Default During the 2007-2009 Housing Bust.” SSRN Electronic Journal (December 31). doi:10.2139/ssrn.1626969. http://papers.ssrn.com/abstract=1626969. Edmonds, T N, L J Stevenson, and J Swisher. 2011. “Forgive Us Our Debts: The Great Recession of 2008-09.” Journal of Legal, Ethical and Regulatory Issues 14 (2): 1–16. http://www.scopus.com/inward/record.url?eid=2-s2.0-84863525338&partnerID=40&md5=cc9d8b72b8b94a96ca05b675fccb4560. Gerardi, Kristopher, Kyle Herkenhoff, Lee E. Ohanian, and Paul Willen. 2013. “Unemployment, Negative Equity, and Strategic Default.” http://papers.ssrn.com/abstract=2293152. Guiso, Luigi, Paola Sapienza, and Luigi Zingales. 2011. 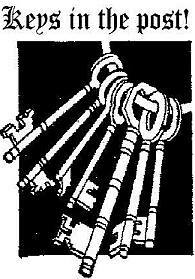 “The Determinants of Attitudes Towards Strategic Default on Mortgages.” SSRN Electronic Journal (March 1). doi:10.2139/ssrn.1573328. http://papers.ssrn.com/abstract=1573328. Riley, Sarah F. 2013. “Strategic Default Behavior and Attitudes Among Low-Income Homeowners” (February 1). http://papers.ssrn.com/abstract=2282518. Seiler, M J. 2013. “The Role of Informational Uncertainty in the Decision to Strategically Default.” SSRN Electronic Journal (January 29). doi:10.2139/ssrn.2211933. http://papers.ssrn.com/abstract=2211933. Seiler, M J, M A Lane, and D M Harrison. 2012. “Mimetic Herding Behavior and the Decision to Strategically Default.” Journal of Real Estate Finance and Economics. Old Dominion University, College of Business Administration, Norfolk, 23529-0223, United States. http://www.scopus.com/inward/record.url?eid=2-s2.0-84866282494&partnerID=40&md5=bd88e45d25c19dc9afd2a035c384852b. Seiler, M J, V L Seiler, M A Lane, and D M Harrison. 2012. “Fear, Shame and Guilt: Economic and Behavioral Motivations for Strategic Default.” Real Estate Economics 40 (SUPPL. 1): S199–S233. http://www.scopus.com/inward/record.url?eid=2-s2.0-84871824267&partnerID=40&md5=cc8149feb524d374946f70929bc874fa. Seiler, Michael Joseph, Eric A. Walden, and Mark Lane. 2012. “Strategic Mortgage Default and the Decision to Follow the Herd: A Neurological Explanation.” SSRN Electronic Journal (December 27). doi:10.2139/ssrn.2194254. http://papers.ssrn.com/abstract=2194254. White, Brent T. 2010a. “Take This House and Shove It: The Emotional Drivers of Strategic Default.” SSRN Electronic Journal (May 14). doi:10.2139/ssrn.1603605. http://papers.ssrn.com/abstract=1603605. ———. 2010b. “The Morality of Strategic Default.” SSRN Electronic Journal (May 22). doi:10.2139/ssrn.1597835. http://papers.ssrn.com/abstract=1597835. ———. 2010c. “Underwater and Not Walking Away: Shame, Fear and the Social Management of the Housing Crisis.” SSRN Electronic Journal (October 27). doi:10.2139/ssrn.1494467. http://papers.ssrn.com/abstract=1494467. Wilkinson-Ryan, T. 2011. “Breaching the Mortgage Contract: The Behavioral Economics of Strategic Default.” Vanderbilt Law Review 64 (5): 1547–1583. http://www.scopus.com/inward/record.url?eid=2-s2.0-81855184667&partnerID=40&md5=4546d2ad8953dfd098aacad6d2fadffc. This entry was posted in Blogpost and tagged business, economy, mortgages, real-estate, strategic default on July 30, 2013 by brianmlucey. 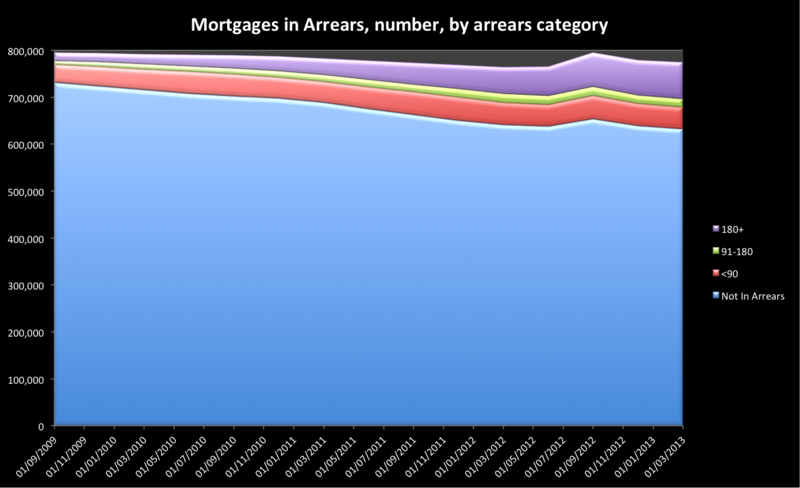 Strategic Defaults in Irish Mortgages – What do and dont we know? Irish residential and Buy to let mortgages are in a mess. 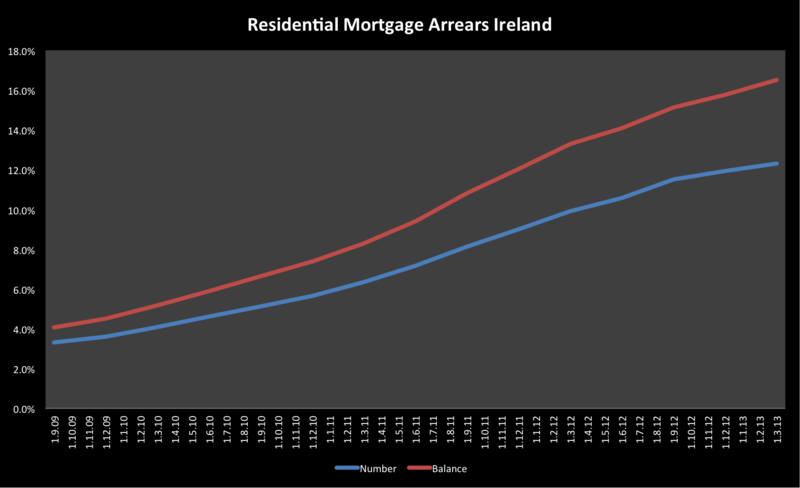 The latest Central Bank data indicate that by value 16.5% of all residential mortgages are in arrears accounting for 12.3% of all mortgages. The charts below show the evolution of this situation. Note that these are only for residential mortgages. Buy to Let are a separate problem, and are commercial loans that if in default should be foreclosed on. There may well be an issue with cross collaterisation of these to residential but again thats a separate issue. One of the issues that arises is “strategic default”, that is to say how many of these 142,000 mortgages in arrears are “wont pay” rather than “cant pay”. The simple answer is we do not know. That doesn’t stop the assumption that “its a lot”. Today we see in an otherwise excellent discussion by Davy stockbrokers on the banks the statement ” A growing culture of strategic non-payment of debt “. How do they know its growing? From what base? To what level? The meme is that its 1/3 of arrears in default are “Strategic” , Wont Pay defaulters. This arises from a post by Professor Gregory Connor where he took US studies and tried to map the findings to Ireland. This is a difficult and thankless task but absent anything else its all we have. This then begs the question : where is this analysis? So far as I am aware there is none. A proper analysis of the issue of strategic or wont pay default would require the following, I contend. a survey of all defaulters, or a representative sample thereof. Now, it may be that this is already underway. But if its not then it should be. I am perfectly happy to undertake this research pro-bono, and I am sure that other academics would help. This information, the bare knowledge of who is defaulting and why, needs to be surfaced. We cannot devise strategies if we dont know the problem. We cant simply map the situation in the USA, with wildly different legal and economic systems, to Ireland. This entry was posted in Blogpost and tagged economy, ireland, mortgage arrears, mortgages, residential mortgages, strategic default on July 30, 2013 by brianmlucey. 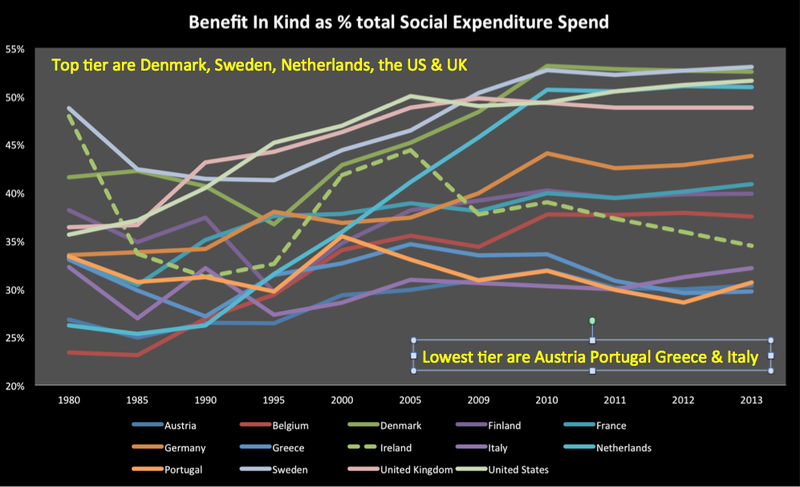 Below is a chart taken from OECD data on this composition. A high level means lots of benefits in kind and not much cash (as a percentage of total expenditure). Its for all programmes, and show this issue in fairly stark terms. Note how things have changed in Ireland over the years. We show the biggest variation over time of all. Initially we gave people things, then we gave cash then as we got rich we gave things now we are back to cash. This is hardly indicative or supportive of a consistent and coherent policy on social expenditure. This entry was posted in Blogpost and tagged benefit in kind, economy, social expenditure, welfare on July 28, 2013 by brianmlucey. We are actually deeply cynical and were poor. We didnt really think the Celtic Tiger was real, so we (the masses) were open to manipulation. We were led to believe the cause and effect was – buy houses, get rich. Meanwhile a small interconnected group of selfperpetuating elites were floating in a moral and effect free mist – they were and are self perpetuating and protecting, so they didnt care about cause and effect. t’s not the bankers’ actions that have outraged people — pretty much everyone had a fair idea that this was what had gone down. It’s the overpowering sense of amorality revealed on the recordings, which were released by the Irish Independent newspaper. The bankers have a great laugh about the situation. It genuinely never seems to mean anything to them that the taxpayer is going to be forced to pay their bills, to the tune of tens of billions. More than that: it never seems to occur to them that their actions might harm people. this amorality could be a symptom of something deeper: a total disconnect between action and consequence. THE Irish are notoriously cynical, but the Utopia myth hit at exactly the moment when we were most open to unquestioning belief. The majority of Irish people were so desperately poor, for most of the country’s history, that when suddenly we weren’t broke any longer, the cynicism was washed away by the flood of prosperity. We needed to believe that the Celtic Tiger hadn’t simply wandered in, because that would mean it could wander out again. We needed to believe that we had somehow made it happen, and that therefore there were things we could do, like buying overpriced houses, to make it keep happening. We needed, basically, to believe in that chain of action and consequence. And so the Irish tendency to raise an eyebrow at anything that’s presented as certain paradise dissolved just at the moment when it was needed most. This is a expanded version of my Irish Examiner column for 27 July 2013. Economics and statistics are intimately entwined. Many economists spend their time devising more and more intricate ways to estimate, forecast, decompose and otherwise analyse relations between various data series. Much of what passes for economic commentary is reportage and discussion of new releases of economic data or revisions to previously released statistics. Think of all the times we have heard and seen headlines on unemployment, stock market indices, PMI indices, leading and lagging indicators etc. Many confuse economic statistics and actual economics. And yet, this data diving is neither economics nor even good reportage for the most part. Economics is not about data. Its about how one thinks. Data are inputs into economic thinking. And data are more than figures from the CSO, data should include personal experience, anecdotes, qualitative data. Merely because it is not quantitative does not make data any less useful nor does it imply that it cannot be analysed and interrogated in a rigorous fashion. Economics is a human societal phenomena (for the most part) and thus the entire gamut of data we process as humans should be used for the analytics of the phenomena. Much economic statistical reporting shows the trap of being precisely wrong rather than approximately right. Even allowing for the fact that quantitative data are easier to analyse, we need to be careful about the quality of the analysis. Modern econometric techniques are mindbogglingly complicated. But we don’t need complex techniques to deal sensibly with data. We need common sense and some basic statistics. Consider some series that get a lot of airplay – unemployment, quarterly national accounts and purchasing managers indices. Both are important data series and are widely and correctly followed. Both are released regularly and while subject to some revision the reality is that the initial release is the one on which the press and the politicians pounce to prognosticate. Both are very volatile, but this is usually mentioned only in passing. Basic statistics tells us that when a series is volatile there is a chance that it will show a rise and a chance that it will show a fall. There is a chance that it will show no change. We can and we should take into account the volatility of the data when we analyse it, and more to the point the reportage of the data should do so. This doesn’t happen. We will not soon see a headline “GDP rises (but its statistically equal to zero and might actually be a fall) in Quarter 2”. A rise in GDP will be greeted as corner turning stuff no matter how statistically meaningless this is. If we look at the Irish data we see significant volatility. This is best indicated by the standard ‘measure’ of recession, two successive quarters of declining GDP. By that measure we have been in recession four times (and out three times) since 2007. The reality is that it is one long recession. The GDP and GNP data are extremely volatile. GDP quarter to quarter changes are slightly less volatile than GNP, contrary to what many think and despite the GDP data being subject to distortion from the MNC sector. If we look at the quarter to quarter changes we see that they average about 1.4% quarter to quarter. If we look at the data knowing how volatile they are and how much the average change is we can consider some ‘bounds’ within which, statistically, the data should lie. This is called the ‘standard error’ . There are other measures to give these confidence intervals but all are in essence variations on a theme. Using this gives us a sense of whether or not we can be confident that a small rise or fall is in fact one, given the way the data jump about. Similarily for PMI data, we can only despair at times at the commentary. A PMI reading below 50 indicates contraction. This doest not stop people from comenting along the following lines – PMI rose from 47 to 48, indicating a rebound in managers expectations. That is not the case. 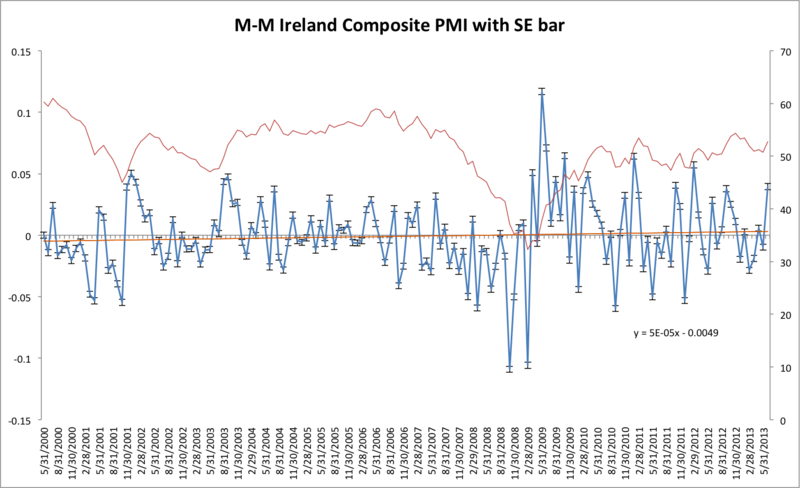 What is the case is that first, the mean monthly change in composite PMI in Ireland is almost indistinguishable from zero, and second the volatility of the data suggests that any month to month interpretation is an exercise in futility. That doesn’t stop commentators breathlessly proclaiming doom or salvation depending on the direction of this essentially random series. 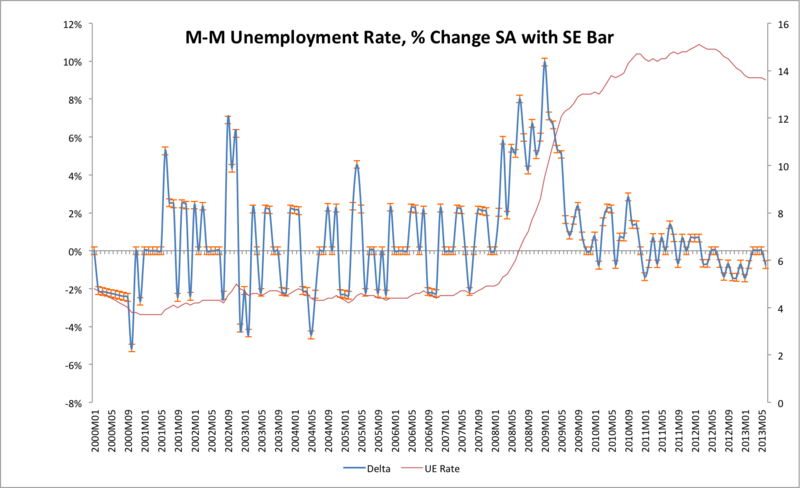 For unemployment the average change in the rate (not the numbers) over the last 13 years has been a very small decline. Since 2010 the average month to month change has again been very close to zero. Again this does nothing to stop minor blips up and down being hailed as proof of austerity failing or working. The trend is the key not the month to month volatile changes. It doesn’t have to be this way. There is nothing to stop the CSO or even newspapers themselves from taking half an hour to do some simple statistics. Instead of reporting on monthly or quarterly changes that are volatile and inherently meaningless, it would be nice to see reportage looking at three or six month averages, at some confidence intervals, at some degree of statistically meaningful measures. This would make for more boring but much more accurate reporting. If journalists, or more like Editors, wish to go beyond surface reportage then some skull sweat is required, both of readers and writers. This entry was posted in Blogpost, Journalism and tagged economics, economy on July 27, 2013 by brianmlucey. For complicated reasons I found myself earlier this week having to drive to Waterville, Country Kerry and leave the car there. This involved then getting back to Sallins, by public transport. To go there I drove, which took a tad over 4 1/2 hours. Coming back was somewhat different. I got a bus from Waterville at 0735 (€17.50), a five minute walk from the house. 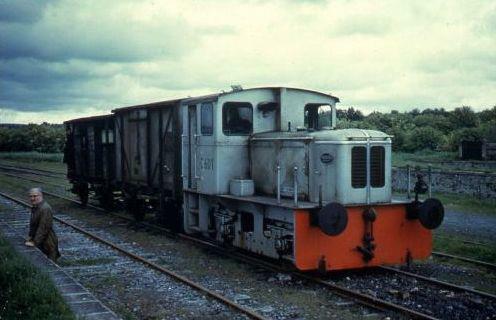 which left me at Killarney Railway station for a train at 0936 (a whopping €62 for this one) This ancient rattletrap eventually dropped us all at Mallow and we joined another train getting into Heuston at 1255. I got a train to Sallins at 1320 (€7) which dropped me at 1350 getting me back to my door at 1400. A total time from door to door 0725-1400 or 6h 35m. Yes, I know billions have gone into roads. Yes, I know that. I also know that when it takes three times as much money and half as long again on bus and train which mode of transport I would suggest to people. If we want people to use public transport, lets make it a viable alternative – if its going to be slower make it cheaper, if its going to be more expensive make it faster than going one ones own. This entry was posted in Blogpost and tagged cars, economy, public transport, running cost, trains, transportation on July 26, 2013 by brianmlucey.